Anonymous: King Edward VI and the Pope, an Allegory of Reformation, (NPG 4165). The 16th century anti-papal propaganda painting shows Henry VIII on his deathbed and his son Edward VI on the throne. Iconoclasm is depicted in the window-like inset. Until 1874, the painting was the property of Thomas Green, Esq., of Ipswich and Upper Wimpole Street, a collection ‘Formed by himself and his Family during the last Century and early Part of the present Century’ (Roy C. Strong: Tudor and Jacobean Portraits, 1969, p.345). It was sold by Christie’s 20 March 1874 (lot 9) to an unknown buyer. I am curious about who might have purchased that painting. 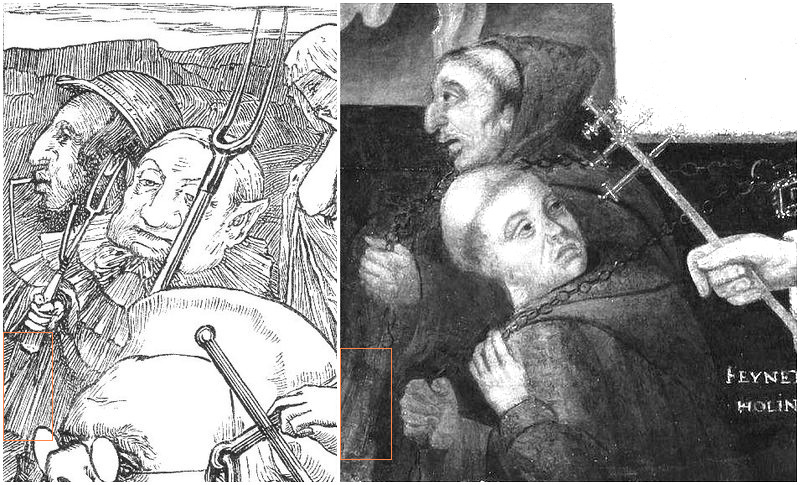 Edward VI and the Pope: An Allegory of the Reformation. National Portrait Gallery, London. Inscribed on open book, centre left: “THE WORDE OF THE LORD ENDURETH FOR EVER”; on ribbons of pope’s tiara: “IDOLATRY” and “SUPERSTIC[ION]”; on pope’s chest: “ALL FLESHE IS GRASSE” (‘All flesh is grass,’ from Isaiah 40:6, meaning the body is ephemeral); lower left in the golden frame: “POPS” and “FEYNED HOLINE[SS]”. The painting represents the handing over of power from Henry VIII to his son Edward VI. Henry lies in bed, and Edward sits on a dais beneath a cloth of state, with a book at his feet containing a text from Isaiah, which falls onto the slumped figure of a pope. The pope points a triple cross towards two monks, lower left, who pull on chains attached to Edward’s dais. Standing to Edward’s side is a figure identified as his uncle, Edward Seymour, 1st Duke of Somerset and Lord Protector. 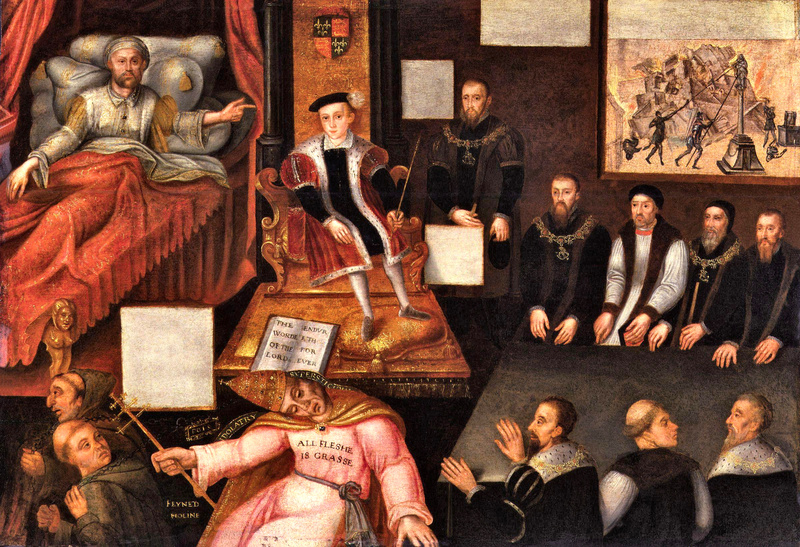 Other figures on the right represent Edward’s Privy Council and include the Archbishop of Canterbury Thomas Cranmer (in white), the Lord Privy Seal John Russell (grey beard), and William Paget (forked beard), the Comptroller of the King’s Household. At top right is a picture of iconoclasm, the smashing of idols, an activity approved of by Cranmer and many religious reformers.